It significantly dwarfs Niagara Falls. Iguazu Falls stretches along a 3 kilometer (nearly 2 mile) long rim that is shared by Argentina and Brazil. I was flabbergasted watching it thunderously plunge the height of a 24-story building into the Iguazu gorge below. The Argentine side has the best and most varied up-close views of Iguazu Falls while the Brazilian side has the spectacular panoramic view. My best advice: See both. Go during the rainy season (normally the rain is heaviest from around December to February). However, you might encounter cold and dreary days as well as sightseeing trails that are occasionally closed due to rain damage. Go during the dry season (typically from April to July). Unfortunately, Iguazu Falls noticeably dwindles in strength. If you are very unlucky, Iguazu Falls may be completely dry (which occurs for a week or more every several decades or so). 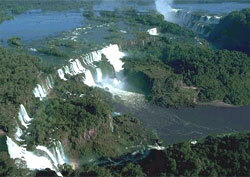 Visit Iguazu Falls in March, August or September.